Celebrate mardi gras with a colorful monkey bread King Cake made with homemade or canned biscuit dough, pecans, and colored sugar icing. Last November I took my fist trip to New Olreans ever. I fell in love with that city the minute I stepped off the airplane. 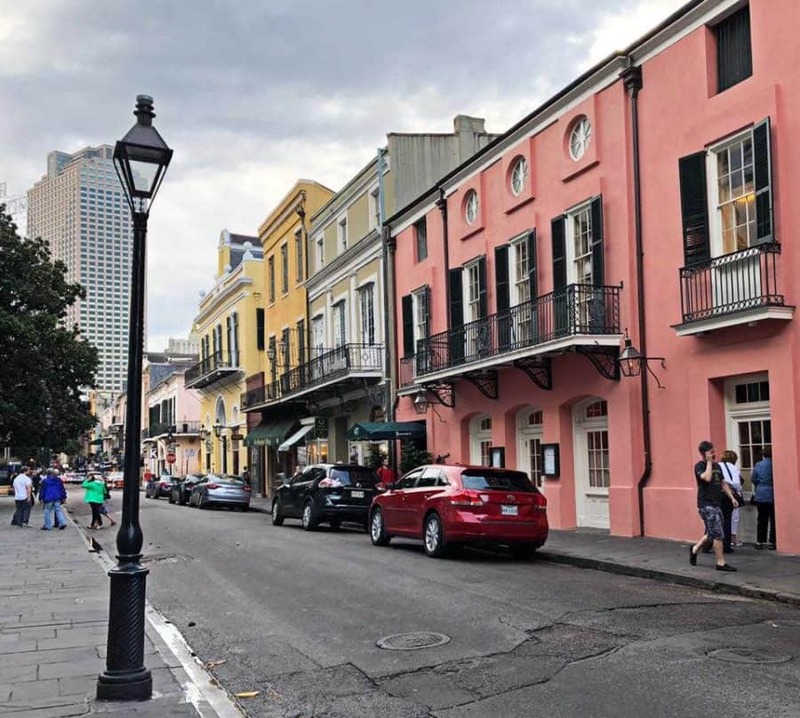 There is just something about New Orleans that grips your heart. 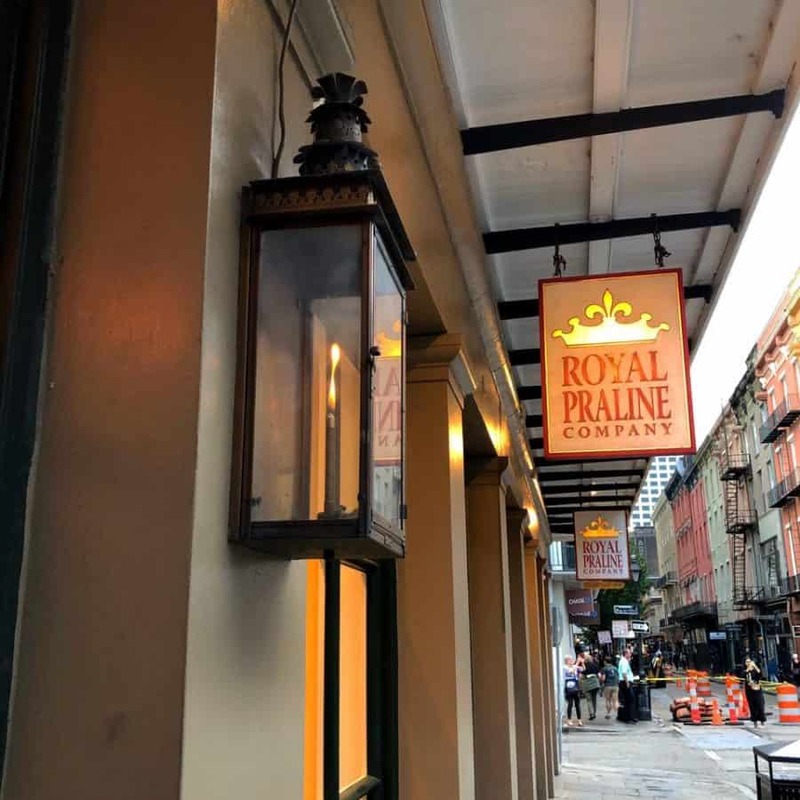 There are a lot of things to love about New Orleans: the music, the architecture, the people and, of course, the food. Oh, the food! 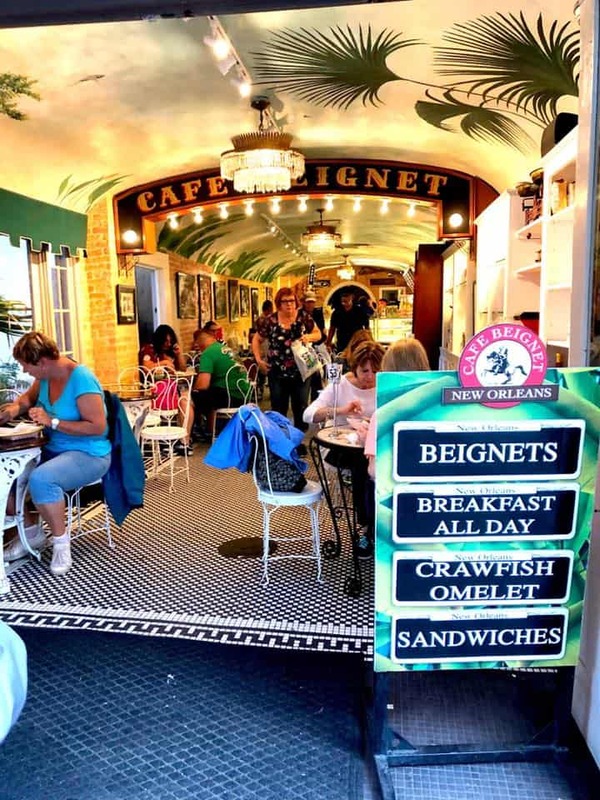 From beignets to Po' Boys to Shrimp Etouffee, New Orleans food is some of the most flavorful and fun food you'll ever eat. The King Cake is a New Orleans tradition that is generally associated with Mardi Gras, the time between January 6th and Ash Wednesday. Usually the King Cake is a round cake similar to a Bundt cake. It is baked with a small plastic baby hidden inside and the person who gets the slice with baby in it has to host the next party. 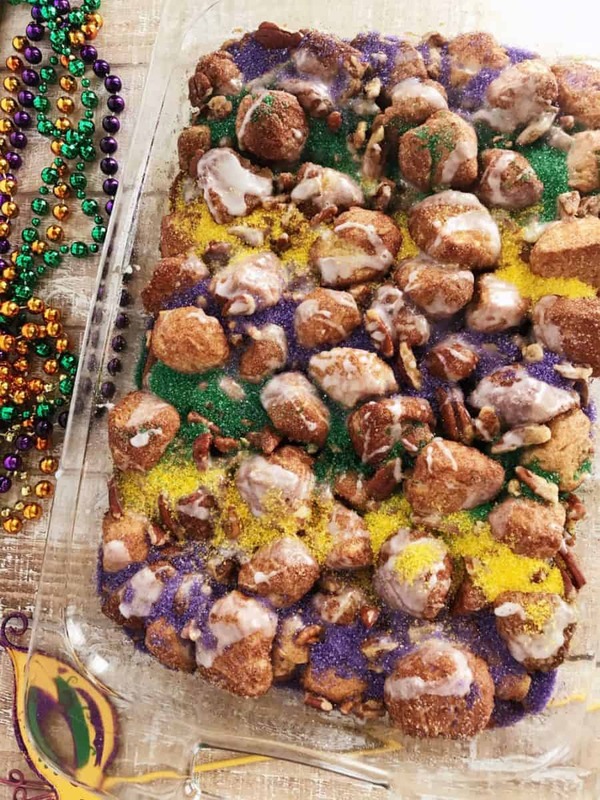 We made the King Cake a little easier and made it in to Monkey Bread – kind of. 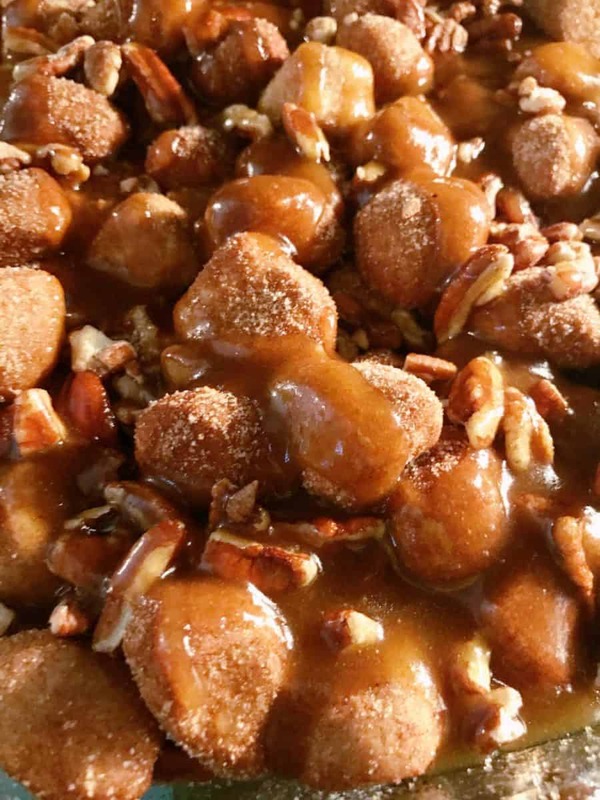 Monkey bread is a pretty quick and easy cake or bread to make. 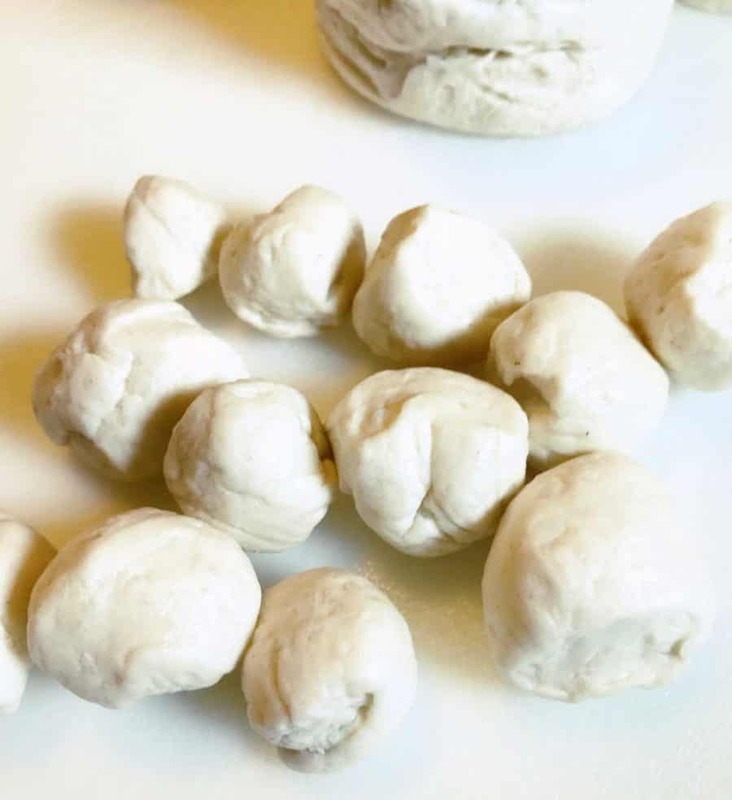 You can make homemade from scratch monkey bread, or you can grab a couple of cans of refrigerated biscuit dough and use that instead. 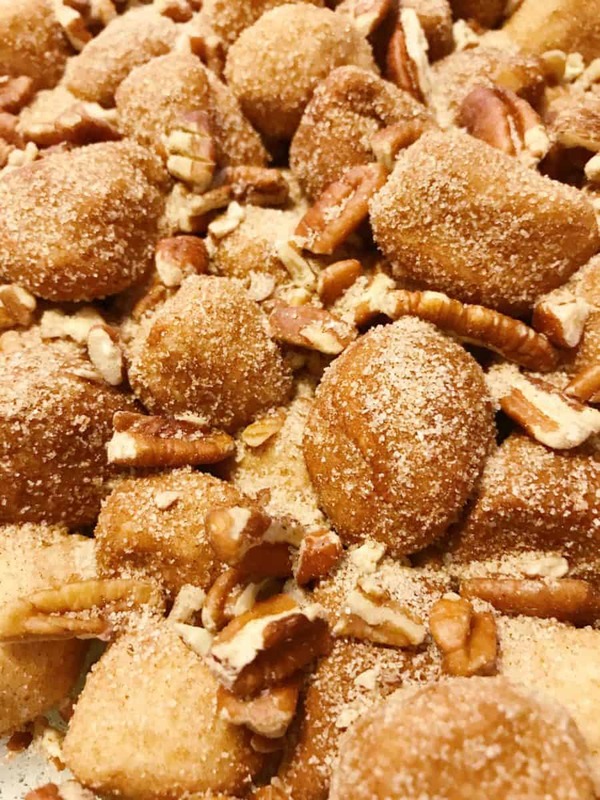 This is a pretty traditional monkey bread recipe. 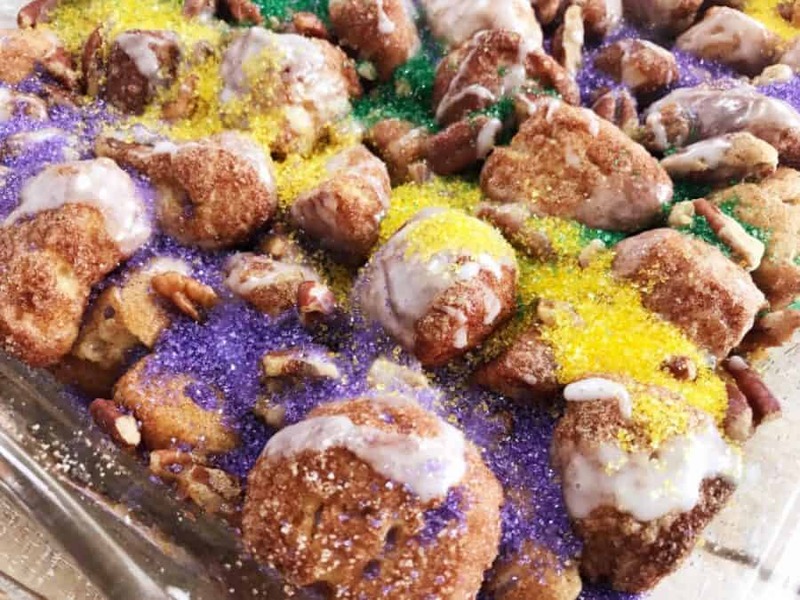 We added pecans because New Orleans is also famous for Pecan Pralines and the traditional gold, purple, and green sugar which is found on top of a traditional King Cake. Preheat oven to 350 degrees. Prepare a 9×13 casserole dish with non-stick cooking spray. You could also make this in a more traditional round shape by using a Bundt pan. Remove biscuits from cans and separate into individual biscuits. 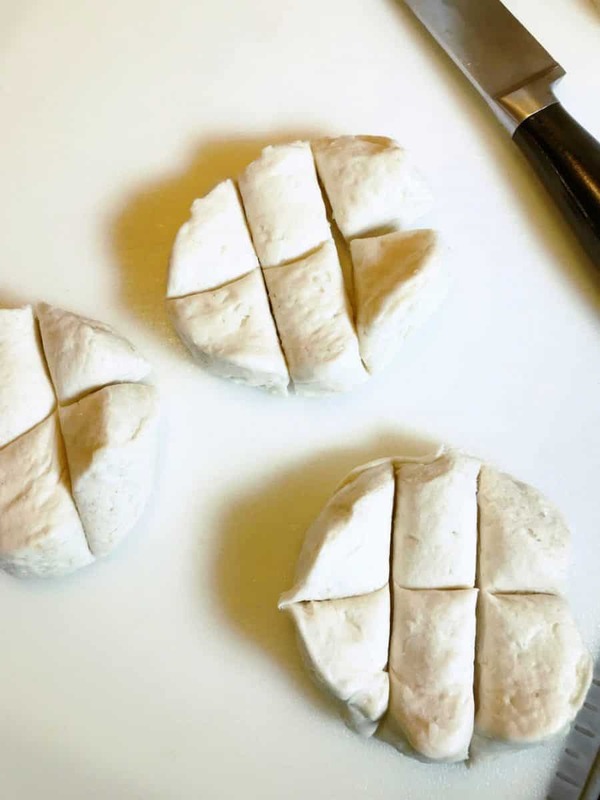 Cut each biscuit into 4 to 6 pieces. Roll the each of the smaller sections of the biscuits into balls. Set these aside for a moment. 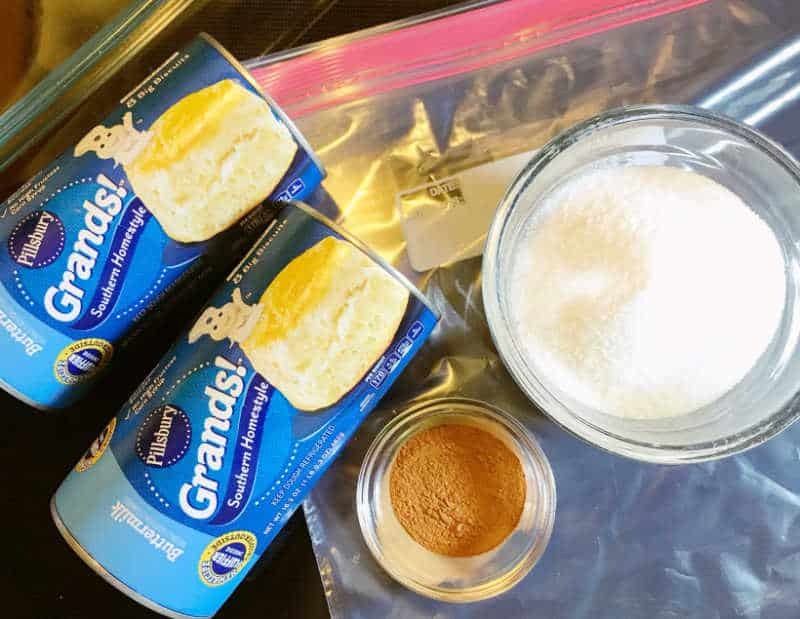 Combine the cinnamon and granulated sugar in a gallon zip-top plastic bag. 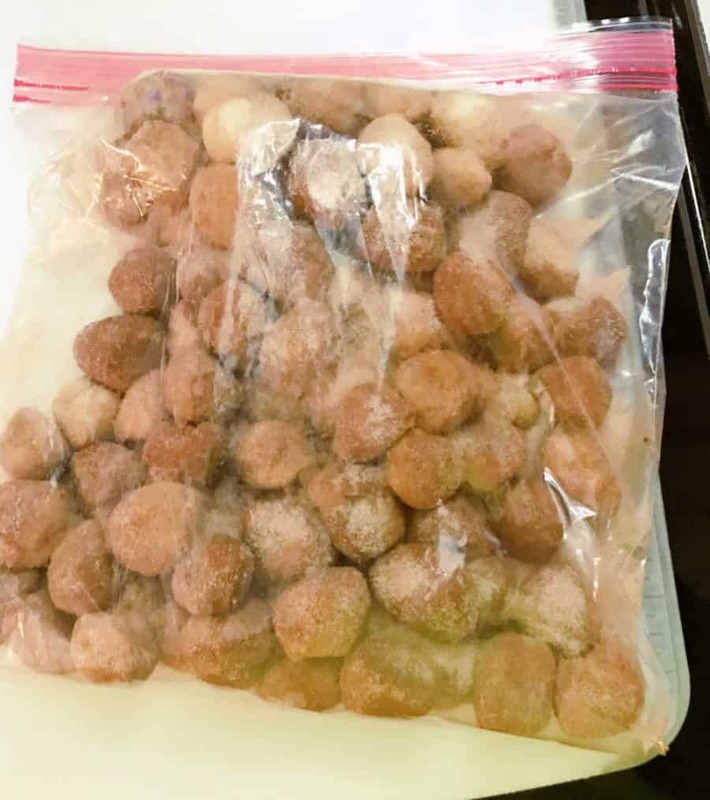 Drop the biscuit balls into the bag and seal. Shake until the biscuits are evenly coated with the sugar mixture. Scatter ¼ cup of pecans in the casserole dish. 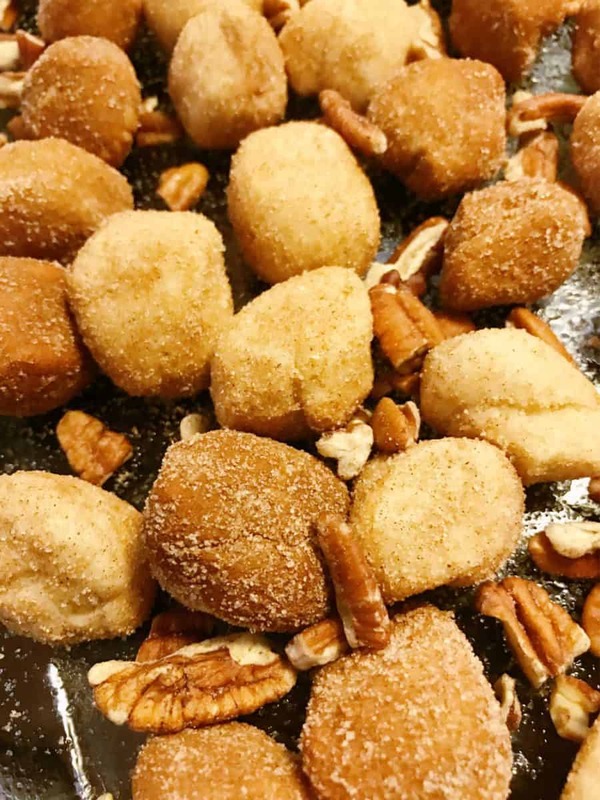 Remove half of the covered biscuits from bag and place over pecans. Add another ¼ cup of pecans over the biscuits. Then, add remaining biscuits, topping with remaining pecans. In a small mixing bowl, combine the melted butter and brown sugar. Mix until completely combined. Pour the sauce evenly over casserole. Bake the monkey bread for 25 to 30 minutes or until the biscuits are done. Remove casserole from oven. While the monkey bread cools a bit, stir together the powdered sugar and milk until smooth. Drizzle over monkey bread. 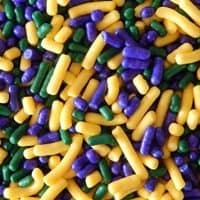 Sprinkle with decorative sugars in yellow, purple and green. 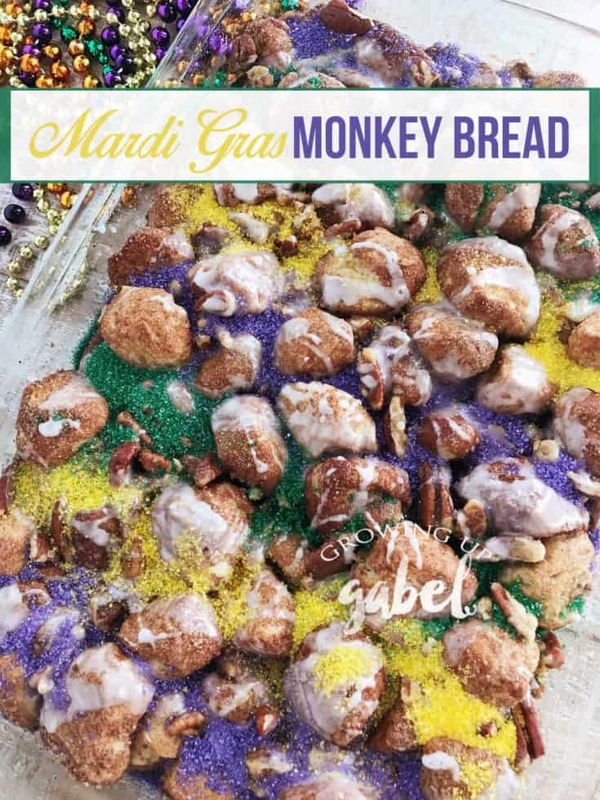 While this may not be a traditional King Cake, this monkey bread is a fun and easy way to celebrate Mardi Gras with your family. Preheat oven to 350 degrees. Prepare a 9x13 casserole dish with non-stick cooking spray. Remove biscuits from cans and separate into individual biscuits. 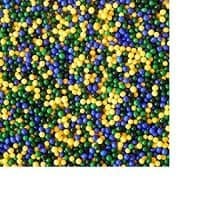 Cut each biscuit into 4 to 6 pieces and roll into balls. In a gallon zip-top, combine the ground cinnamon and granulated sugar. Drop biscuits in the bag and seal. Shake until the biscuits are evenly coated with the sugar mixture. Scatter ¼ cup of pecans in the casserole dish. Remove half of the covered biscuits from bag and place over pecans. Add another ¼ cup of pecans over the biscuits. Then, add remaining biscuits, topping with remaining pecans. 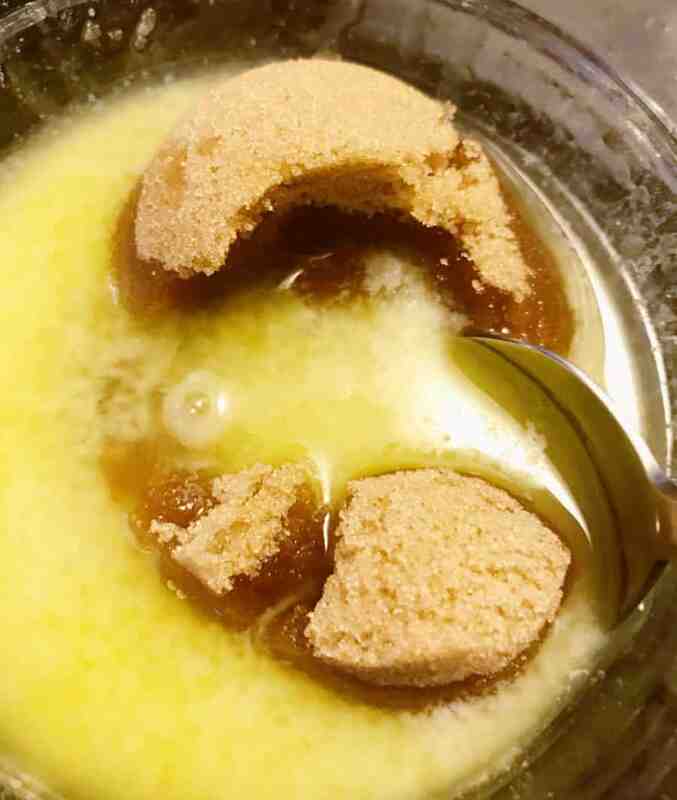 In a small mixing bowl, combine the melted butter and brown sugar. Mix until completely combined. Pour evenly over casserole. Bake for 25 to 30 minutes or until the biscuits are done. Remove casserole from oven. 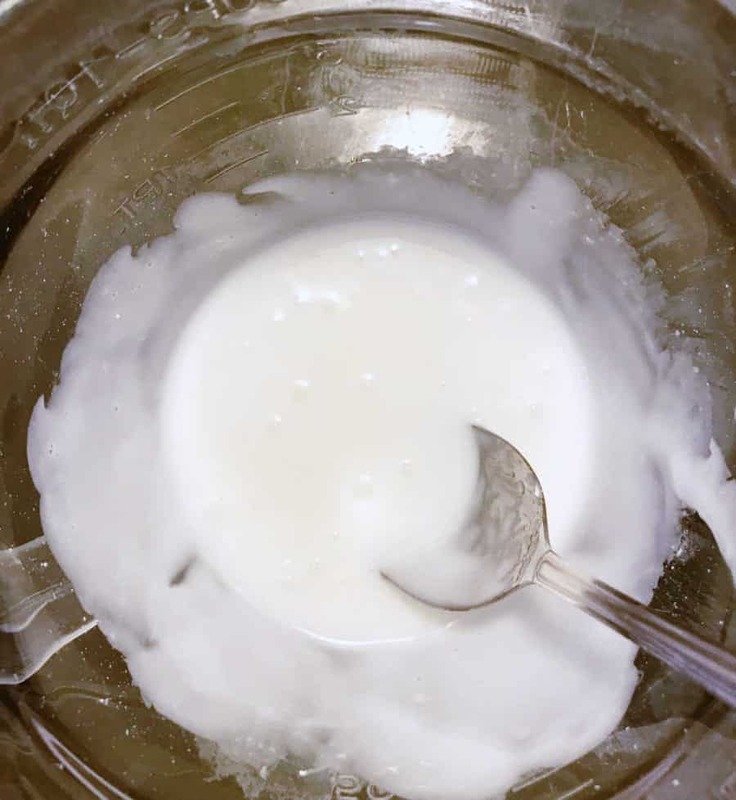 Stir together the powdered sugar and milk until smooth. Drizzle over monkey bread. 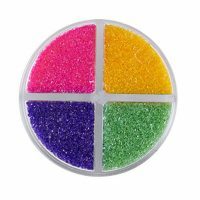 Sprinkle with decorative sugars, if desired.